On Friday some friends and I took The Needle Shop's Sewing 101 class together. It's fantastic. People who have never seen a sewing machine in real life march proudly out of class four hours later brandishing a pillow with a zippered cover. I had put zippers in pillows before, but never correctly so I always hoped nobody would look under there. Now I'm a kung fu zipper master. 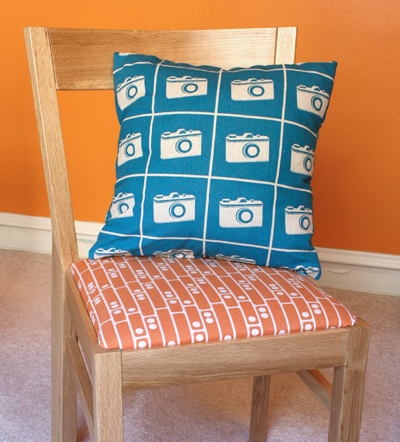 This is the pillow I made in class with Kokka camera fabric. And then I went home and re-covered every pillow in our living room. 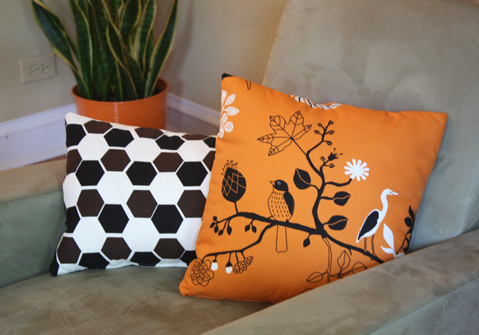 The solid orange and the orange with bird print are from IKEA (purchased early April, but it looks like they still carry it) and the brown and black geometric print was a clearance table runner, also from IKEA. The fuzzy chocolate brown stuff is from the fabric store up the street. All I know about that is that fuzz went everywhere when I made those two, including into my coffee. Love, love, LOVE those pillows. As they say: they POP! FABULOUSLY gorgeous! I love them all!! Absolutely love how you put the patterns together! Well done, Kung-Fu Zipper Master! I just saw that camera fabric in black at Purl Soho in NYC! What a great project, and a brilliant pairing of colors/fabrics! Lately I've been obsessed with making pillow cases. It's so hard to find the right colors or even just finding a pillow with a cute color that isn't priced like an arm & a leg. I love the camera fabric & the orange & black ones!! it really looks pretty!! What a cute idea for a sewing class. I need to learn how to sew better because these things are just too cute!! Any chance you would train us in the secrets of the zipper?? I want to know the zipper secret too. D'you know, I've been hacking my brain to come up with a good colour scheme for my lounge, and your pillows just did it for me! Awesome! I've been thinking of taking this exact same class for a while now. Perhaps I should just bite the bullet? Looks like it was very inspiring! I have an urgent prayer request at arise 2 write. Do it! You'll learn a lot, have fun, and you'll be super proud of yourself. It's worth the money, because your new skills will translate to lots of other projects, not to mention you'll come out with a fabulous pillow. Confidence, knowledge, and inspiration are well worth the class price. Great job!! Man, if I lived in Chicago I would be all over that school!! I love that you just came home and used your skills to give your living room an entirely new look! Go you! I did something similar...I love your material!!! I've been wanting to take the class at The Needle Shop. Good to know it was well worth the money! The pillows look great. Congrats! Pillows are one of my favorite projects (though, I admit, I avoid all things zipper if I can at all manage it) and these look great! Those look awesome! I wish they had something like that near me in San Diego! I love the look!!! This is very inspirational. I hope I'll be able to do something like that in the near future. I love the Ikea fabric. I have used it for several projects over the past 6 months. 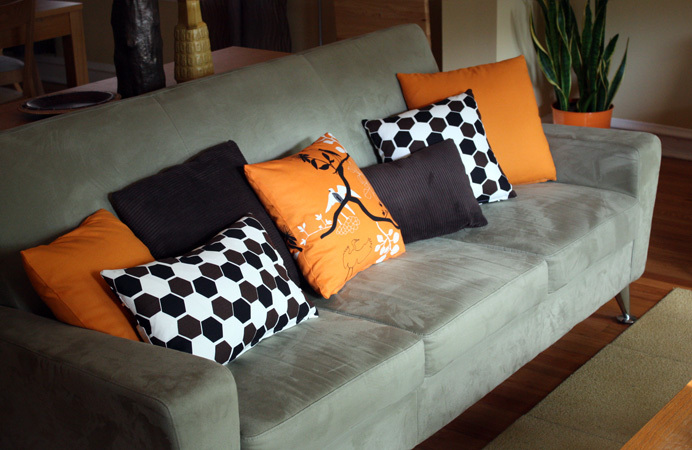 Great combination of fabrics/pillows! Best looking couch on the block!! Oh man! I love those pillows and am very jealous that I can't take some of those classes. Don't you just love Ikea fabric!!?? We recovered our Broyill Brasilia dining room chairs in one of their fabrics. They look fabulous if I do say so myself. I taught myself how to put invisible zippers in pillows, I wonder how these are done? I also made placemats and napkins out of coordinating fabrics from Ikea. The best part its... most of its $5.99 per yard and its a weight that could go upholstery or otherwise. Wow!!!! Love those pillows. Great job. B E A U T I F U L!!!!!!!!!!! I LOVE your pillows and the combination totally rocks! Coming back to ask: Is your couch also from Ikea? I am shopping for a new one and love the color of yours! very impressed that you put your new-found skills into action! I'm the worst for learning stuff and then not acting on it until the new skills have gone sort of rusty...then I get rage! and I love your selection of fabrics and vision of how they go together. I need to work on that. Nathalie, the couch is from Dania Furniture. I don't think they carry this exact one anymore. Love all the patterns but a little too Halloween with the black. Love the orange! Niiiiice ... SO have to find a similar spot with '101' lessons in Toronto! Great job! So funny! I used the SAME fabric in a sewing class for a pillow! Zippers scare me. EEKS! I want to be a kung fu zipper master! One of the things I miss most about Chicago is The Needle Shop. I took two classes there, and they were fantastic. Your pillows look great! I've been itching to recover my living room pillows, but how often is too often? The zippers are always my biggest fear...I'll have to buck up and give it another shot. i love it. anybody know of a free online pattern for zipper pillow covers? I sew a little mostly quilting. I've been thinking about taking one of their classes. Thanks for the post! Maybe I will now! I don't know how to put zippers on anything. that is SO awesome. i want to make pillows now...even though i am completely intimated by my sewing machine.